12 April 2019 (22:28) by Admin Flo Neveresta - Realestate on Neveresta! Hello everyone, and thank you for your support ! -We are so happy to announce you today the creation of our VIP House Building section. -> Read more here ! -We have improved Realesta wiki with new Quests and Respawns. 04 April 2019 (01:14) by GOD Rth Realesta - Neveresta launch date! We are glad to show you further new additions of the coming update. Today we would like to introduce you to the new server upcoming, Neveresta. This new server adds alot of update and only resilient, skilled people will sustain here. -Neveresta will be a very long term server, where you will have to overwhelm yourself. 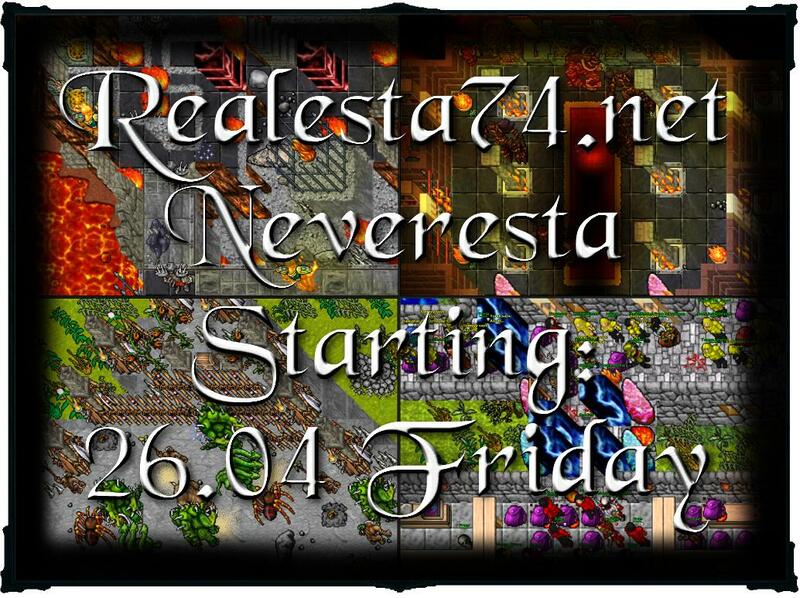 Dear players you can register on Neveresta now, check server info, stay tuned, and be ready for this big new adventures! Always meanwhile you can play our war server. 31 March 2019 (16:48) by GOD Rth Realesta - New server. Pre-tests for the new Neveresta has been done successfully to ensure safety, stability, performance and are concluding. Sorry for the Realesta server who might had side-effects. 15 March 2019 (11:23) by GOD Rth Realesta - Change Log - updated. We have updated change log on [15.03.19], check what's new here. 28 February 2019 (16:38) by GOD Rth Realesta - Change Log - updated. We have updated change log on [28.02.19], check what's new in the server here. 22 February 2019 (14:26) by GOD Rth Realesta - Change Log - updated. We have updated change log on [22.02.19], check what's new today here. 20 February 2019 (14:12) by GOD Rth Realesta - Change Log - updated. We have updated change log on [20.02.19], check what's new here. 14 February 2019 (14:50) by GOD Rth Realesta - Change Log - updated. We have updated change log on [14.02.19], check what's new here.